3. Place on a roasting tray and roast for about 30 to 35 minutes or until golden brown and soft. 1. Remove the ostrich from its sausage casing and mix all the other ingredients together. 3. Let it cook through and with the back of a wooden spoon crush the tomatoes to give a rustic chunky sauce. 1. Place all the ingredients acccept the olives and water into a mixer with its K attachment. 2. Mix through slowly add all the water and mix on high until the gluten in the dough starts to develop and starts pulling away from the sides. 3. As soon as all the dough is clinging to the K attachment mix for anther 3 minutes. 4. Turn down the speed to low and add the olives gently until incorporated. 5. Place the dough in a well oiled bowl and cover to rise to double its size. Create a antipasti platter with slices of the ciabatta with sliced charcuterie, olives, hummus, tzatziki and B-well ﬂavored Garlic and Chilli oil with some herbs chopped into it. ! 1. For an extra naughty taste cover the dough before baking with more of the B-well garlic ﬂavored oil and sprinkle some coarse sea salt and more rosemary over. 3. The bread freezes easily and can be warmed for 8 to 10 minutes in a hot oven before serving. Pour buttermilk into a bowl with the calamari tentacles, set aside for 15 minutes. This will tenderize the tentacles. Pour a bottle of canola oil into a deep, heavy based pot. Heat until sizzling. Sift all the dry ingredients into a large bowl. Drain the tentacles and coat in the flour mixture, immediately fry in batches for 45 seconds to a minute or until golden in colour. Using a slotted spoon carefully remove the tentacles from the oil and drain on kitchen paper. 1. Mix all the mayonnaise ingredients together in a bowl and serve with golden tentacles and a couple wedges of lemon. Tip: Drizzle mayonnaise with a little B-well Chilli infused oil for a spicy bite. Sift the corn-starch into a large bowl. Lightly loosen the egg whites with a whisk in a second bowl and finally scoop the panko into a third bowl. Lightly coat prawns, in the corn starch then dunk into the egg whites and finely the toss through the panko, set aside in the fridge to set. Give them time to chill, this will give you a great crust and help keep them altogether. Heat oil in a large heavy based saucepan and shallow fry in batches. They cook in seconds, when the crumb layer is golden they are ready. Drain on kitchen paper and set aside. 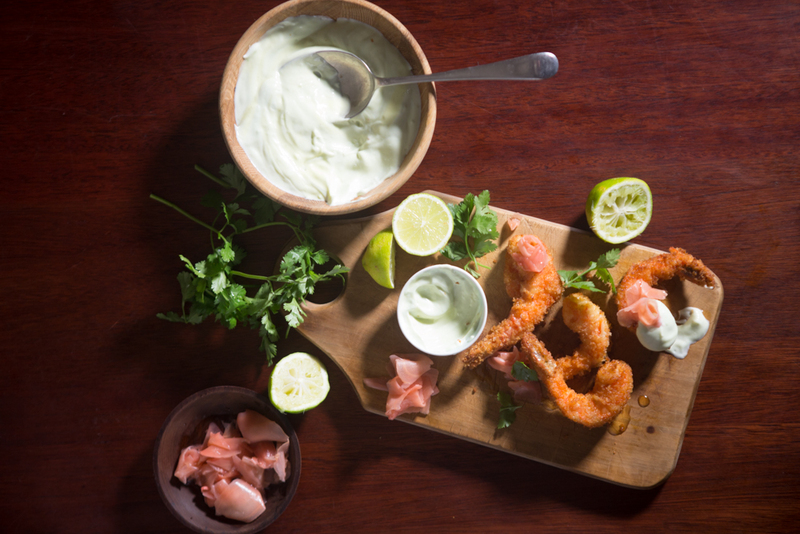 Mix all the mayonnaise ingredients together and spoon into a bowl serve with crispy panko prawns, couple lime wedges and a heap of pickled ginger. 1. Heat canola oil in a large heavy based, flat based potjie pot. 2. Season oxtail with salt and pepper and seal all sides in the pot over a high heat, about 250C, to render the fat. 3. Reduce the heat to a medium heat, about 150C, and stir through the thyme, garlic cloves and shallots and fry to infuse flavours for about 5 minutes. 4. Add the milk stock into the pot and deglaze the flavours from the pot. Then add the beef stock, cover with the lid, and leave to gently cook for about 4 hours or until tender. Pour Bwell canola oil into a fryer or a deep heavy based pan. Season fish fillets with milled salt and ground pepper. Sift dry ingredients into a large bowl and fold through the cold beer to form a batter, a similar consistency to thickened cream. Lightly coat each fillet with flour, and dust off the excess flour. Coat each fillet with batter; drain the excess of batter off the fillets before deep-frying in hot canola oil. Depending on the temperature, the fish should take about 6-8 minutes aside to cook through and turn golden in colour. 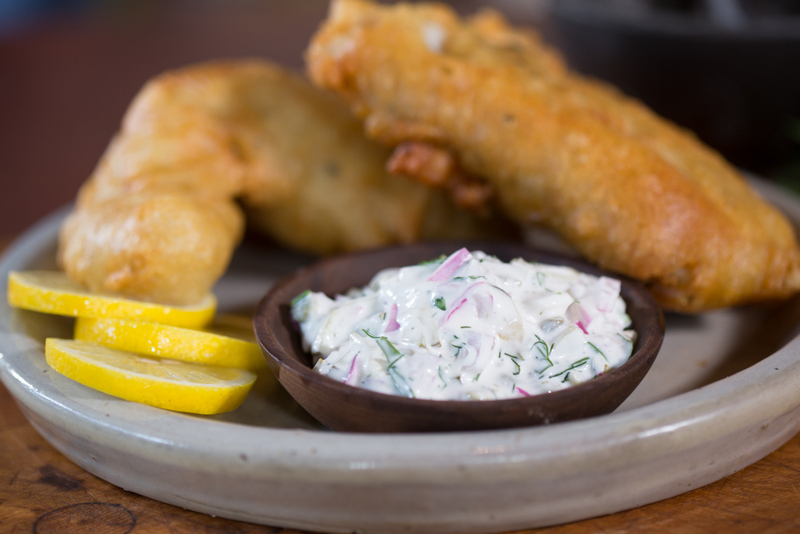 Mix all your tartar ingredients together and serve with deep fried fish fillets and a couple lemon wedges on the side. Do you enjoy Chicken Schnitzel? With this Succulent Chicken Schnitzel Recipe you can make the perfect schnitzel from home. 1. Lay down a 2-foot long strip of plastic wrap on your kitchen countertop. Place chicken breasts on the plastic, leaving a 2-inch space between each breast. Cover the breasts with another strip of plastic, so the meat is sandwiched between two layers of plastic. Use a mallet to pound the breasts until they are a little less than ¼ inch thick. 2. Set up three wide, shallow bowls and a large plate on your countertop. In your first bowl, put the flour. In your second bowl, beat the eggs. In your third bowl, stir together the breadcrumbs, paprika, 1 tsp salt and sesame seeds (optional) till well blended. Leave an empty plate nearby where you will place your coated schnitzels. 3. Pour oil into a skillet until it’s deep enough for frying (about ½ inch). Heat the oil slowly over medium. While oil is heating, dip each breast one by one into your breading bowls—first coat with flour, then with egg, then with breadcrumb mixture. 4. The ideal temperature to fry schnitzel is around 375 degrees F. When the oil is hot (but not smoking or splattering), fry the coated breasts in single-layer batches until they are golden brown on both sides. If your oil is at the right temperature, it should take about 3-4 minutes per side. Don’t fry more than two breasts at a time in a regular sized skillet, or the oil temperature will drop and the schnitzels will become greasy. 5. After frying, set the schnitzels on a paper towel and pat them dry to soak off excess oil. 6. Sprinkle the schnitzels with salt to taste. Serve hot garnished with lemon wedges and your favorite condiment.